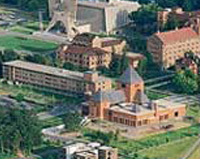 (Collegeville, Minnesota) - Saint John’s University is an all men’s school of approximately 1,900 students. The University is academically partnered with the women’s College of Saint Benedict that is located roughly 6 miles away. The partnership allows for an enhanced education since the two schools combine their curriculum to offer a variety of academic courses. The combined resources of both the schools enable the faculty and staff to provide an excellent education for both men and women. KMC Controls offers training to qualified end users of KMC products. The training program is flexible by offering many forums to ensure that the needs of authorized installing contractors and qualified end users are met. From corporate headquarters in Indiana to regional training in key U.S. cities, trainees can avail themselves to a number of DDC and related courses. In addition, KMC training can be brought conveniently to the door of any building.